OF THE CAPTURE OF THE VILLAGES OF THE MISSION OF ST. IGNACE, IN THE MONTH OF MARCH OF THE YEAR 1649. THE progress of the Faith kept increasing from day to day, and the blessings of Heaven were flowing down in abundance upon these peoples, when God chose to derive from them his glory in ways which are adorable, and which belong to the jurisdiction of his divine providence,—although they have been very severe for us, and were not in our expectations. The 16th day of March in the present year, 1649, marked the beginning of our misfortunes,—if, however, that be a misfortune which no doubt has been the salvation of many of God's elect. The Iroquois, enemies of the Hurons, to the number of about a thousand men, well furnished with weapons,—and mostly with firearms, which they obtain from the Dutch, their allies,—arrived by night at the frontier of this country, without our having had any knowledge of their approach; although they had started from their country in the Autumn, hunting in the forests throughout the Winter, and had made over the snow nearly two hundred leagues of a very difficult road, in order to come and surprise us. They reconnoitered by night the condition of the first place upon which they had designs,—which was Surrounded with a stockade of pine trees, [page 123] from fifteen to sixteen feet in height, and with a deep ditch, wherewith nature had strongly fortified this place on three sides,—there remaining only a little a space which was weaker than the others. It was at that point that the enemy made a breach at daybreak, but so secretly and promptly that he was master of the place before people had put themselves on the defensive,—all being then in a deep sleep, and not having leisure to reconnoiter their situation. Thus this village was taken, almost without striking a blow, there having been only ten Iroquois  killed. Part of the Hurons—men, women, and children—were massacred then and there; the others were made captives, and reserved for cruelties more terrible than death. Three men alone escaped, almost naked, across the snows; they bore the alarm and terror to another and neighboring village, about a league distant. (from where. Ste Ignace or Ste Marie)This first village was the one which we called Saint Ignace, which had been abandoned by most of its people at the beginning of the Winter,—the most apprehensive and most clear-sighted having withdrawn from it, foreboding the danger; thus the loss of it was not so considerable, and amounted only to about four hundred souls. The enemy does not stop there; he follows up his victory, and before Sunrise he appears in arms to attack the village of Saint Louys, which was fortified with a fairly good stockade. Most of the women, and the children, had just gone from it, upon hearing the news which had arrived regarding the approach of the Iroquois. The people of most courage, about eighty persons, being resolved to  defend themselves well, repulse with courage the [page 125] first and the second assault, having killed among the enemy some thirty of their most venturesome men, besides many wounded. But, finally, number has the advantage,—the Iroquois having undermined with blows of their hatchets the palisade of stakes, and having made a passage for themselves through considerable breaches. Toward nine o'clock in the morning, we perceived from our house at Sainte Marie the fire which was consuming the cabins of that village, (This village must have been close to Ste Marie and within clear sight - much closer than the current marked sight of Ste Louis) where the enemy, having entered victoriously, had reduced everything to desolation,—casting into the midst of the flames the old men, the sick, the children who had not been able to escape, and all those who, being too severely wounded, could not have followed them into captivity. At the sight of those flames, and by the color of the smoke which issued from them, we understood sufficiently what was happening,—this village of Saint Louys not being farther distant from us than one league. Two Christians, who escaped from the fire, arrived almost at the same time, and gave us assurance of it. In this village of Saint Louys were at that time two of our Fathers,—Father Jean de Brebeuf and Father Gabriel Lallement,  who had charge of five closely neighboring villages; these formed but one of the eleven Missions of which we have spoken above; we named it the Mission of St. Ignace. Some Christians had begged the Fathers to preserve their lives for the glory of God,—which would have been as easy for them as for the more than 500 persons who went away at the first alarm, and had abundant leisure to reach a place of security; but their zeal could not permit them, and the salvation [page 127] of their flock was dearer to them than love for their own lives. They employed all the moments of that time, as the most precious which they had ever had in the world; and, during the heat of the combat, their hearts were only fire for the salvation of souls. One was at the breach, baptizing the Catechumens; the other, giving absolution to the Neophytes,—both animating the Christians to die in the sentiments of piety, with which they consoled them in their miseries. Accordingly, never was their faith, or the love which they had for their good Fathers and Pastors, more lively. An Infidel, seeing affairs in a desperate condition, spoke of taking to flight; a  Christian, named Estienne Annaotaha, the most esteemed in the country for his courage and his exploits over the enemy, would never allow it. " What! " he said, " could we ever abandon these two good Fathers, who for us have exposed their lives? The love which they have had for our salvation will be the cause of their death; there is no longer time for them to flee across the snows. Let us then die with them, and we shall go in company to Heaven." All this band of Christians fell, mostly alive, into the hands of the enemy; and with them, our two Fathers, the Pastors of that Church. They were  not killed on the spot; God was reserving them for much nobler crowns, of which we will speak hereafter. The Iroquois having dealt their blow, and wholly reduced to fire the village of Saint Louys, retraced their steps into that of Saint Ignace, where they had left a good garrison, that it might be for them a sure retreat in case of misfortune, and that the victuals which they had found there might serve them as refreshments and provisions for their return. On the evening of the same day, they sent scouts to reconnoiter the condition of our house at Sainte Marie; their report having been made in the Council of war, the decision was adopted to come and attack us the next morning,—promising themselves a victory which would be more glorious to them than all the successes of their arms in the past. We were in a good state of defense, and saw not one of our Frenchmen who was not resolved to sell his life very dear, and to die in a cause which—being for the interests of the Faith, and the maintenance of Christianity in these countries—was more the cause of God than ours; moreover, our greatest confidence as in him. 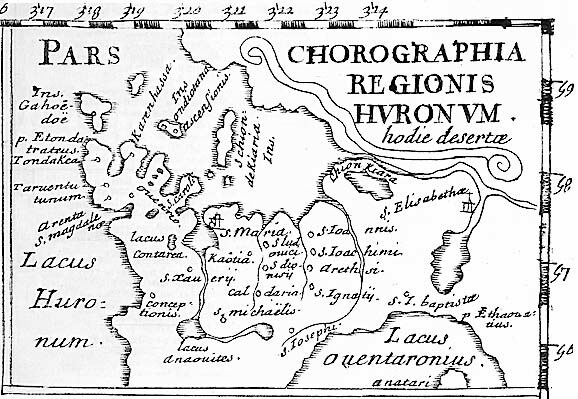 Meanwhile, a part of the Hurons, who are called Atinniaoenten (that is to say, the nation of those who wear a Bear on their coat of arms), having armed in haste, were at hand the next morning, the seventeenth of March, about three hundred warriors,—who, while awaiting a more powerful help, [page 131] secreted themselves in the ways of approach, intending to surprise some portion of the enemy. About two hundred Iroquois having detached themselves from their main body, in order to get the start and proceed to the attack of our house, encountered some advance-guards of that Huron troop. The latter straightway took flight after some skirmishing, and were eagerly pursued until within sight of our fort,—many having been killed while they were in disorder in the midst of the snows. But the more courageous of the Hurons, having stood firm against those who joined combat with them, had some advantage on their side, and constrained the Iroquois to take refuge within the palisades of the village of Saint Louys,—which had not been burned, but only the cabins. These Iroquois were forced into that palisade, and about thirty of them were taken captives. The main body of the enemy, having heard of the defeat of their men, came to attack our people in the very midst of their victory. Our men were the choicest Christians of the village of la Conception, and some others of the village of la Magdelaine. Their courage was not depressed, although they were only about one hundred and fifty. They proceed to prayers, and sustain the assault of a place which, having been so recently captured and recaptured, was no longer adequate for defense. The shock was furious on both sides,—our people having made many sallies, notwithstanding their small number, and having often constrained the enemy to give way. But,—the combat having continued quite far into the night,—as not more than a score of Christians, mostly wounded, were left, the victory remained wholly in the hands of the Infidels. It had, however, [page 133] cost them very dear, as their Chief had been seriously wounded, and they had lost nearly a hundred men on the spot, of their best and most courageous. All night our French were in arms, waiting to see at our gates this victorious enemy. We redoubled our devotions, in which were our strongest  hopes, since our help could only come from Heaven. Seeing ourselves on the eve of the feast of the glorious Saint Joseph, the Patron of this country, we felt ourselves constrained to have recourse to a Protector so powerful. We made a vow to say, every month, each a Mass in his honor, during the space of a whole year, for those who should be Priests. And all, as many as there were people here, joined to this, by vow, sundry Penances, to the end of preparing us more holily for the accomplishment of the will of God concerning us, whether for life or for death; for we all regarded ourselves as so many victims consecrated to Our Lord, who must await from his hand the hour when they should be sacrificed for his glory, without undertaking to delay or to wish to hasten the moments thereof. The whole day passed in a profound silence on both sides,—the country being in terror and in the expectation of some new misfortune. On the nineteenth, the day of the great Saint Joseph, a sudden panic fell upon the hostile camp,—some withdrawing in disorder, and others thinking only of  flight. Their Captains were constrained to yield to the terror which had seized them; they precipitated their retreat, driving forth in haste a part of their captives, who were burdened above their strength, like packhorses, with the spoils which the victorious were carrying off,—their captors [page 135] reserving for some other occasion the matter of their death. As for the other captives who were left to them, destined to die on the spot, they attached them to stakes fastened in the earth, which they had arranged in various cabins. To these, on leaving the village, they set fire on all sides,—taking pleasure, at their departure, in feasting upon the frightful cries which these poor victims uttered in the midst of those flames, where children were broiling beside their mothers; where a husband saw his wife roasting near him; where cruelty itself would have had compassion at a spectacle which had nothing human about it, except the innocence of those who were in torture, most of whom were Christians. Of course we are dealing with an English translation of the French word for "fire" and as well Fr. Ragueneau's poetic license. I beleive the three escaped survivors ran from St. Ignace II to warn the village of St. Louis.